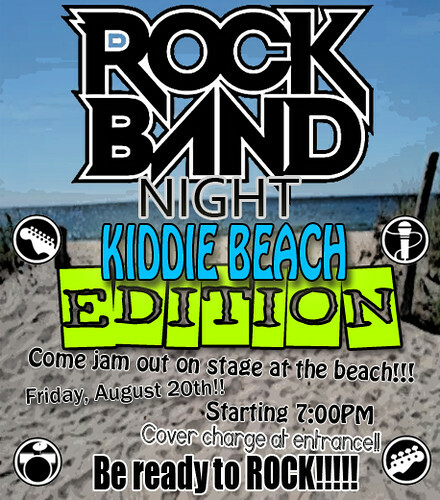 Come one come all to Kiddie Beach for a night of Official Sponsored Rockband Night. For those that don’t know…Think of Rockband as karaoke but with an entire of your friends playing instruments! If you don’t have a large group you can still play! Anywhere from 1 to 4 can play. Lead guitar, bass guitar, drums and microphone. For you technical people out there we will be using: an Xbox 360, hundreds of DLC, The AC/DC Track Pack, All Lego Rockband songs. You may bring your own (non modded) instruments. Is this being projected on the Movie Screen? hmmmm…Ghostbusters or Walking on Sunshine…what a dilemna!